Hutchison provides for the reader a concise, if not easily readable, summary of the history of modernism within American Protestantism. He traces the earliest modernist impulse back to the old Unitarians. His narrative maintains a distinction between liberalism and modernism. All modernists are liberals, but not all liberals are modernists. Liberalism could make headway within religion without the input of modernity. Modernism, however, made use of the modern Zeitgeist. Of course, this does not mean that liberalism and modernism are sealed off from one another. Very early on liberalism and modernism would become subsumed under the single referent, modernism. 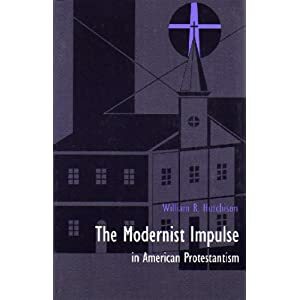 Hutchison primarily traces the American form of modernist Protestantism beginning with the Unitarians and ending with the Niebuhrs. As such, it makes a tacit statement that the modernist form of religious liberalism is primarily a bygone thing. Hutchison offers barely a hint of Process Theology or the ethnic-gender-socio-economic theologies. His scope seems limited when compared to Gary Dorrien’s ponderously exhaustive three volume history of religious liberalism. Hutchison’s treatment, however, seems to be an improvement on Kenneth Cauthen’s seminal work on American religious liberalism. I hope to be able to examine both of these works in the future. As such, Hutchison’s work stands prospective to Cauthen and retrospective to Dorrien.